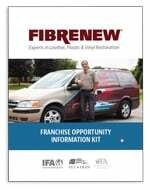 Ann Benes of Fibrenew Lincoln was the 14th Fibrenew Franchisee in the US. Today, Fibrenew has over 240 franchise locations in 5 countries. In this video interview, Ann talks about the flexibility of her work schedule as being one of the biggest reasons why the Benes family decided to invest in a Fibrenew franchise. She is able to see her children off to school in the morning, work a full day in her bustling business repairing leather couches, restoring vehicle interiors and refurbishing medical exam tables and then return home before her kids arrive from school. She is also able to attend sporting and school events because of this flexibility in her business schedule. Ann absolutely loves this and wouldn’t have it any other way.